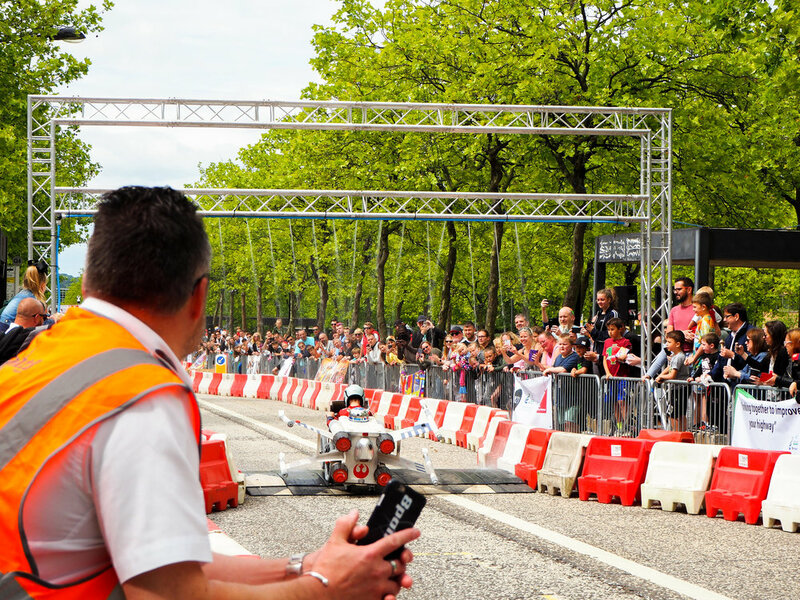 Our client MK Council approached us with a huge creative project, to organise Milton Keynes' very first Soapbox Derby! An invitation for all ages the day saw awards for both the fastest and most creative racers, all in aid of the fantastic local charity Willen Hospice. The task had been set. Working from the ground up we needed to engage and inspire people to get involved in an event they had never seen in Milton Keynes before. So, we got all our best thinkers together and put the wheels in motion to ignite the first soapbox derby. Our approach took the passion for Milton Keynes embodied in those who proudly call it home and the drive of a strategic social media campaign, to create a community of people all sharing the same goal. Getting down that track as quick as possible and in the most stylish way possible. Working with the council, we began to coordinate one of the biggest events of the summer and on one of the most iconic streets in Milton Keynes, Midsummer Boulevard. It all started with a logo. Chris, our magical designer, began developing the look and feel of MK's very first Soapbox Derby. From there we created a website, banners, videos and not to mention a good little bit of social content, to drum up all the support we could get. Before we knew it over 2.2k people were interested. We started receiving some fantastic photos of carts in the process of being made, lots of little kids and a few big ones too (but who wouldn't be with the opportunity to race) all creating and having buckets of fun. It wasn't long until anticipation for the day was growing. To fill this desire, even more, we released sneak peaks of the track and test runs of carts. Before we knew it race day had arrived, racers were ready, and the spectators were growing. It didn't take long for news to travel and spectators were pouring in from all around MK. With the help of some fantastic local businesses and volunteers, we were ready to get the day started. Off to set the pace, we had our junior racers set at the top of the course, prepared for twist, turns, ramps and our favourite a water cannon. Shout out to our fav junior racer, the tank that literally had all the bells and whistles, even its own water cannon. Already we had lots of people sharing their snaps and their favourite karts. So, I was on community management for the day, making sure that everyone who shared and commented or posted got responses. We also spent the day snapping photos and sharing stories (check out our 'Making-of' highlight on Insta to see all the fun). By midday, the adult race was underway where we saw lots of amazing Soapboxes, which had been made with not only a strategic eye but also a whole kart load of creativity. We saw some flying times as people shot down the course. The odd few may have needed an encouraging push, but by the second run, everyone was season pros. After all the fun of the adult race, it was time for the final race of the day, the business race. We saw some fantastic local businesses lining up ready to show off their racing skills and their karts. And oh didn't they have some fantastic karts to show off! Our highlight was the fabulous Toy Story gang racing down before Andy got home. In matching outfits and a kart to match, they honestly looked amazing racing down the MK Soapbox course. In total, we raised £2113.37 for Willen Hospice, reached over 108k people, had so many amazing karts and many requesting for it to become a yearly event. We want to say an extra big thank you to all our volunteers, all of those who spent hours building karts and to all those who came on the day, for making MK's very first Soapbox Derby a success.